Swing over: bed 8-1/4", cross slide 4-5/8"
Travel: compound rest 2-1/8", cross slide 3"
Approx. shipping weight: 166 lbs. The G0768 was very well packaged in wooden crate, with no transport damage. Watching You Tube videos reviewing typical small Chinese built lathes, I expected it to be very dirty and way out of adjustment; to my surprise, after disassembly and inspection, the lathe was very clean and most adjustments were very accurate. I could have used the lathe right out of the box. Some tweaking made the operation even smoother. The included accessories of all metal gears, steady rests, 3&4 jaw 4"chuck, faceplate, and assorted tools is unmatched by competing lathes. The DC brush motor seems to have good power, but does have a fairly loud hum which apparently is associated with control circuitry. 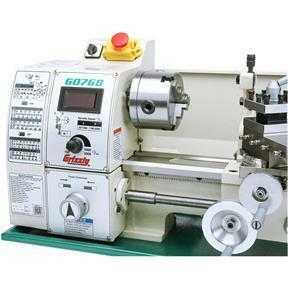 The only feature the lathe lacks is a 'gear selector' to change between high & low speed range. 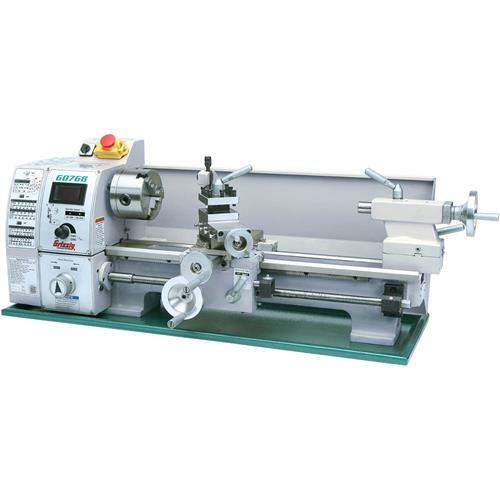 This lathe uses a belt and pulley to switch the speed range, but with the variable speed control, its not a huge factor. The cross slide and compound slide both use 4 Gib adjustment screws, whereas, most competitors only have 3 Gib adjustment screws. This provides better adjustment for smoother slide movement. 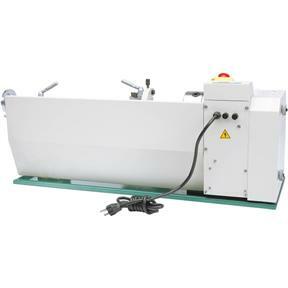 The main carriage also has a locking bolt which can be helpful for facing cuts. Overall, I feel the lathe has good bang for the buck! I have not got to use my lathe yet. Once my garage is set up where I need it, I will start using my awesome lathe. I've had the lathe for around a year and it's been a good machine to learn on. The fact that it has some short-comings, I think is a good thing as it gives you the opportunity to start developing the mechanical/technical skills needed in machining. 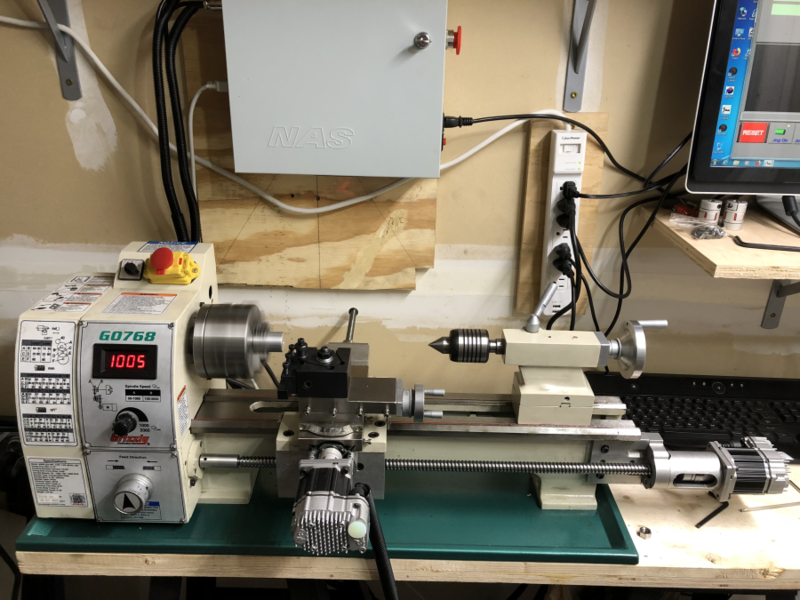 If you're shooting to complete work with tolerances of +/-.005" this lathe is good to go out of the box. With a little elbow grease, some mods, and lots of patience you can turn diameters to +/-.0005" with it. For me, the biggest problem with the lathe is the lack of features, everything else you can improve yourself. The main feature that I didn't know better to get when I first purchased the lathe was a quick change gear box. 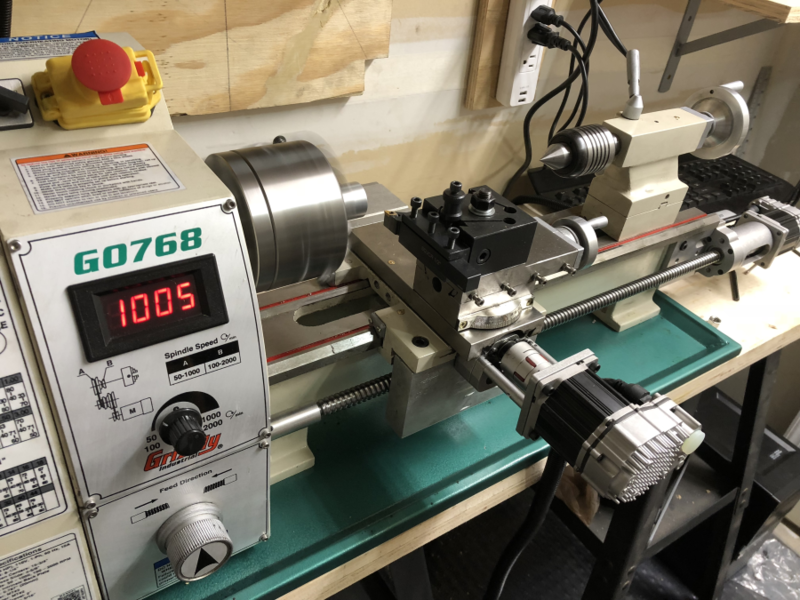 This lathe is limited to 2 power feed settings, both of which are very coarse (.007 & .004 in/rev); to change these it takes no less then 5 minutes to change out the necessary gears. The first time I did it it probably took me closer to half an hour. My solution to this was a custom powered system (see picture). This allows for super fine feeds which really helps me get a good surface finish. Also, to change from low to high speed range is timely and cumbersome- to the point where I never do it. Modifications I've made are as follows: external power feed, a CAM lock compound lever for quick angle setting change (was a real pain the way it came), lapped carriage, cross-slide, and compound dovetails (I would recommend scraping if you have the energy to learn), cross-slide lead screw thrust bearing installation for smoother operation, longitudinal cheap DRO, tailstock DRO, and a quick change tool post. The lathe spindle total indicated runout out of the box was around .003" which I wasn't thrilled with because I know many people get theirs with around .001". I was able to change out the spindle bearings to P5 class bearings and get less than .0002" TIR which helped surface finish as well as the ability to work to closer tolerances. The actual spindle its self was .0002" runout which for a machine of this caliber is pretty good. With these modifications I'm pretty happy with the lathe. The main things which are forcing me upgrade are lack of power and lack of a quick change gear box. Using a cutoff tool in steel it is easy to lock the lathe up. Once trick I learned was to use the cutoff tool upside down so the workpiece doesn't grab the cutter. If I was to do it over again I would have gotten G0752, G060, or even the G04002. That's not saying this isn't a good lathe for someone. If you want something that's relatively easy to move around but is more substantial than the mini lathes go with this. You can easily bring this lathe up or down stairs and at 150lbs it doesn't take a very substantial table. But if weight isn't an issue go with something bigger with more features for a little more money. I think with the little extra money you'll have a nicer machine which will take much longer for you to outgrow. If I had to do it again I wouldn't let size/weight dictate what to get. You can always figure out how to get it to your workshop one way or another- even if this means partial disassembly. The one quality issue I've had with the lathe is the carriage gib breaking which was immediately replaced my grizzly. I've dealt with customer service for my G0704 mill as well and they have always been very helpful. I bought this lathe specifically for modification into CNC. UPS freight delivered my lathe on time and without damage. Assembly and connection took about one hour. I bought 2 motors ClearPath SDSK-2311S-RLN (teknic.com) and conversion kit from Billy Dirk (bdtoolsusa.com). Breakout board C11G purchased from Arturo Duncan (cnc4pc.com). Also I bought Quick Change Tool Post Set T10167 (some modification required) from Grizzly and installed it. After all modifications the machine works really great with Mach3 software and I'm so happy with it! 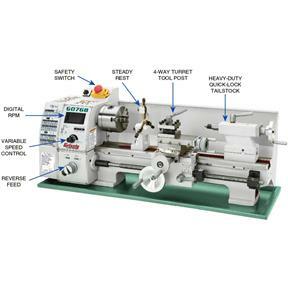 I recommend this machine to anyone who wants to work with a good lathe, as well as those who plan to convert the lathe into a CNC machine. 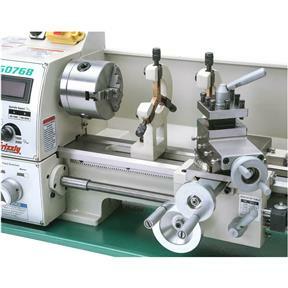 In my opinion this is the best small size lathe on the market for reasonable price! After modification the machine works really great with Mach3 software and I'm so happy with it! is a real pain. My 7 X 12 Grizzly had more power. Great benchtop lathe. I have found that the machine is not very rigid, even after adjusting all of the gibs. I had a some issues with GO768 lathe there were little damage on outside and gears was very loose. I return this one and upgraded to G4002 and I am very happy with upgrade. G4002 has much more power, but it need 240 volt to run it. Swing over the bed in close proximity of spindle is 13.25" without taking spacer out that will be all I need. Machine weight around 900 pounds, that makes it steady even with objects which are out of round shape. 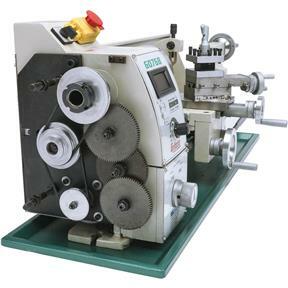 Again very happy with purchase, it is real production lathe machine. -Be prepared to take the lathe apart on day one. The ways are not deburred on the edges and the "oil" they use is terrible. The gibs are not adjusted at all. Just be prepared to completely take apart the carriage, debur, clean, oil, and adjust everything. DO NOT just start running material. -To be a 3/4 HP machine it feels quite underpowered. I suspect its the low quality DC motor drive, more on that below. -10 months after purchase my DC motor drive failed. Looking at it you can tell it is extremely poorly made. Solder connections are poor, components are undersized, etc. Mine was replaced under warranty. If the warranty replacement fails I will replace it with a 3rd party motor driver which will allow use of the full 3/4 HP of this machine. -Tool post is a joke, a machine of this price should include a basic QCTP. Buy one cheaply somewhere, dont bother struggling with shims on this one. With all those points, I still think its decent value for the money. If this fits your need it could be a good machine for you if you are willing to put a little effort in. If you are completely new to mechanical machinery and dont have the skills to tinker with something or if you are a machine shop where labor is 20x minimum wage I would look elsewhere. I do think this machine will last my lifetime with my level of use, but I will certainly have to perform some repairs more than maintenance over its life. Bought a month ago used it for what I needed machine works great. Can't wait to use for other projects. I am happy with my milling machine but my chuck on my lathe is not working well. Both the 3 and 4 jaw chuck hangs up. Other than that I'm happy with both machines. Is there any way I can get a replacement? Nice lathe with potential but the biggest draw-back is the motor. It last the power this lathe should have. There are of course work-a-rounds to fix this problem but it would void the warranty. Upgrade the motor and you have a nice little lathe. I've had the lathe a few weeks, I really love it, but the power feed is starting to vibrate in 1 direction(it was running really smooth). I hope it's not too bad of a problem. Other than that, I really love it. The only complaint I have(and I already mentioned this in another review) was I had to order this lathe and a mill separate(next day), so I asked Grizzly to hold the mill till the lathe was shipped, but they shipped it anyways. Luckily UPS saved the day and arranged for them to be delivered together, or it would of cost me double to hire movers to get the machines into my basement. So far, I am very happy with it - Decent product for the price - Grizzly service excellent. I bought this little lathe last month and I couldn't be happier. I plan on making additional purchases in the future also. 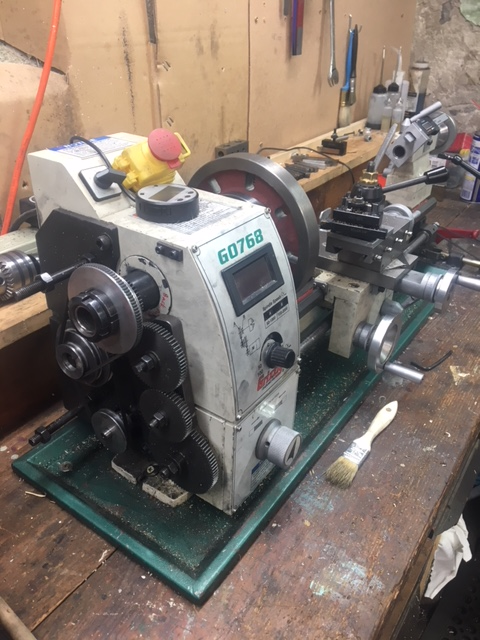 I have always wanted a metal lathe and I am happy with this Grizzly 8x16 lathe and had fun making parts. This lathe is a good footprint larger and heavier build then the very common 7" X 16" lathe. 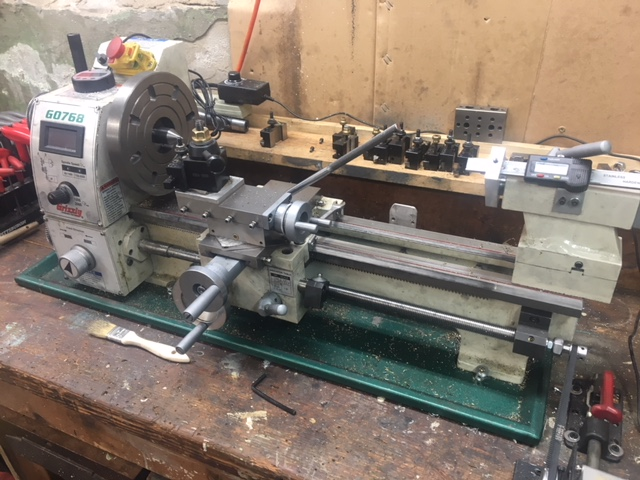 I am glad I bought this Model and after a little fine tuning this lathe I can do and have done some really precise work with this wonderful well build lathe. The price was not breaking the bank. I do enjoy the DC motor with torque and the speed control with the digital readout. Nice to have when parting, knurling und work with different material like plastic's, brass or aluminum. I think I am well served with this product. When someone like me with not to much shop space is looking for a better than the average lathe, take this lathe seriously in consideration. Love it... I do strongly recommend the quick change tool holder kit. love the adjustability of the machine. good machine, bad description it did not fully list the threads it could and couldn't cut. I pulled the trigger when it went on sale for $950 plus shipping. Shipping crate showed damage, but not in area that might affect the product. Unpacked, cleaned off the wax/grease shipping protective material, and de-burred gib edges and lapped the machined surfaces with wet/dry paper on a sheet of glass. First project was to mount an AXA QCTP onto the compound without altering the boss or the M10x1.5 stud. Certainly would like to own a larger heavier unit, but the G0768 fits my work space, and my level of expertise at the present time. uTube videos are very helpful in starting out. There are a few non-obvious things about this lathe. 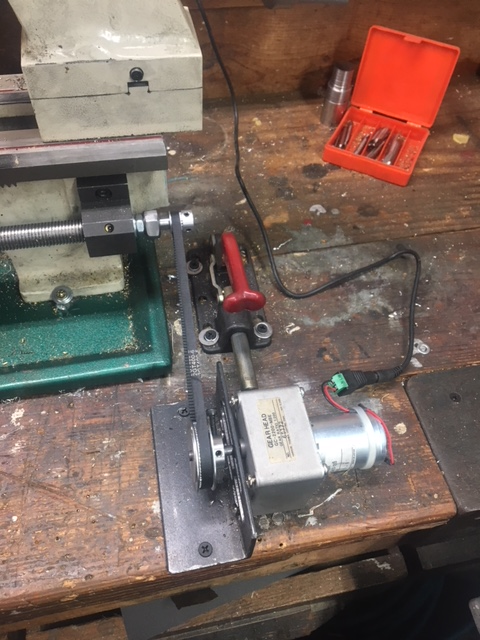 You can move one of the belts to change the spindle speed between high and low ranges- I was thinking that this would be better than the plastic gear used on mini-lathes (which tends to break). However this belt change is not easy. You need to remove the side panel to access the belt and adjust a set-screw, OK. But very annoyingly, you must also remove the back panel with the circuit board on it to loosen a nut which holds a belt pulley in place. This is not an easy or quick operation. 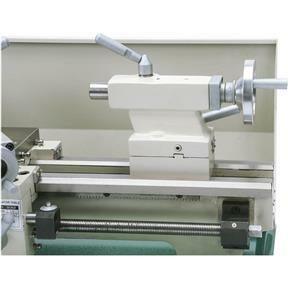 I was thinking that the low belt position would be good to increase torque at low spindle speeds, but there is a label which says that you should not run the motor at high speed for long and suggests to leave the belt in the high speed position. Others have pointed out the weak design of the compound rest locking screws, but there is more: notice that the compound hand-wheel has two handles, preventing quick single-handed rotation. This is because the compound leadscrew has no proper bearings (just a hole in thin metal) and the mating threads are right in the steel of the sliding part of the compound. There is enough play that the handwheel binds if you try to rotate it single handed. The cross slide design is better (there is a long hole to keep the leadscrew straight, and brass threads set up to be deformed slightly from a set-screw for backlash compensation). I think the smaller mini-lathes also now have a better design- notice that many of them have a chrome hand-crank for the compound. Like most mini-lathes, the cross slide and compound wheels are marked as 40 mils per rotation, but it uses metric lead-screws, so this it's really 39.37 mils per rotation. I don't think this is a big deal, but think it would be better to mark the wheel in .025 mm increments to match the screw. The main carriage wheel moves the carriage one inch per rotation (I mention this because it's not documented). A minor point is that it is all too easy to crash the carriage into some sheet-metal covering the motor. The issue is that during work you are focused on the tool post, chuck and front of the lathe, so it is not so obvious that this interference exists in the back. You should put some tape on the bed to mark this position in the front. When you buy a chuck for the tailstock, get a normal MT#2 arbor, not a short one made for mini-lathes. The arbor needs to be long enough to be ejected by the tailstock wheel. Another good point is that the brushed motor of the G0768 is very quiet (from what I can tell it's quieter than the SC4 brushless). Recently purchased because of the size. I&#39;m a retired tool and die maker that wanted a &quot;hobby&quot; lathe. I&#39;m very surprised at the feed cuts I&#39;m able to take. I was concerned with it being only a 3/4 hp motor. It takes them with ease (steel and hard steel). You can lock the carrage for face cuts by putting the carrage direction in netural and engageing the carrage feed lever(to lock the half nuts). The dial measurements are very accurate (checked with dial indicator). I came well packed by ups freight. Make sure you do the bearing run-in (see owners manual-set up instructions) to save your self headaches in the future. This is a VERY WELL made machine, I&#39;m VERY IMPRESSED with it. HIGHLY RECOMENDED !!!!! I purchased this machine originally back in May, but it arrived damaged so I refused delivery and Grizzly sent me another one. Since then, I have experimented with the machine and found that it has tight tolerances, which is a great thing. The end gears NOT being nylon was an awesome upgrade. I recently installed a QCTP because I got really tired at having to shim up the cutters - something which should come included. Also, the cross slide/boss problem is an issue, but not insurmountable. I am overall pleased with the presentation and usefulness of the tool and have (since June) put it to use on several house projects (we own a completely custom home so nothing is standard) that without it, I would be at a loss. 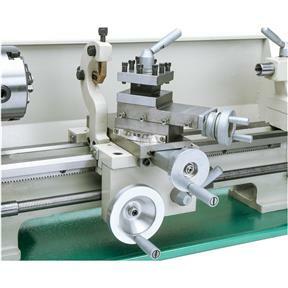 I think that lathes are, in general, the grandfather of all machine tools and for any DIYer, essential. The variable speed capability is a huge deal for me, and one that really pushed this model over the top. Overall, I am pleased with the machine. Nice little hobby machine, but for thousand bucks, a T-slot should be STANDARD on the compound slide for quick tool post. Please re-design.